As librarians and early childhood educators who do storytimes and music programs on a regular basis, we are often on the lookout for new, interesting, interactive ways to do our programs. But they can’t be just any old activities. They have to be activities that fit into the goals of early childhood literacy as well as child development. This can be a time consuming pursuit. Time that we don’t always have. And that is what makes this new series so great. 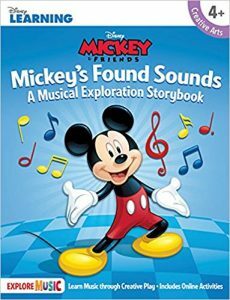 Launched in 2017, this three book Disney Learning “Explore Music” series from Disney and Hal Leonard is aimed at children ages 4-8. Based on an early childhood music curriculum and featuring well known Disney characters, all of the hard work and research is already done for educators by a team of experts and presented in a program ready package. This book begins with a brief story. When the Main Street Parade is rained out, Mickey and all of his friends return home where Mickey proposes they put on a parade of their own by creating their own marching band. Following the story, easy-to-follow instructions show how to make a bucket drum, oatmeal conga drum, plastic bottle shaker, tube kazoo and glass jar xylophone using common household items. Clear photos accompany the instructions. This entry into the series introduces readers to Moana and her family and friends. 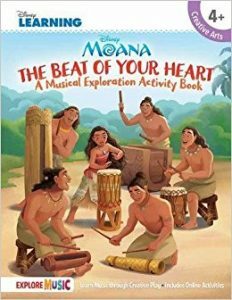 The concept of rhythm is woven throughout the book as children are encouraged to find the beat within themselves, learn pati and po clapping and are instructed in making and playing a lali, a fala and a pahu. A Tangled-inspired story is used to show all of the ways that sounds and music surround Rapunzel wherever she goes. 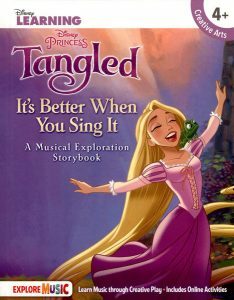 Woven into the story are “It’s Better When You Sing It!” tips and suggestions for trying out new ways to express yourself with your voice. Each book comes with an online component that includes a video read-along, an audio sing-along and additional activities and music to go along with those introduced in the book. There is enough activity and story in a single book to build an entire program around, or you can pick and choose activities to incorporate into your already existing programs. This well thought out, sleekly produced series is a must have for anyone who shares the love of music with the children in their lives.